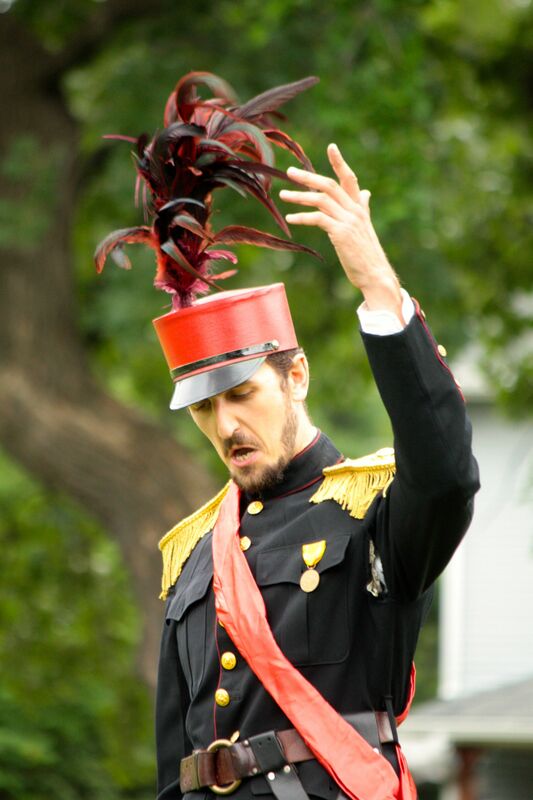 The variety and number of happenings in Saint Paul are nearly boundless. I’m not talking about the big events, the ones you hear about, read about or see on the news. No, it’s those that receive little or no publicity but are vital to the (buzzword alert!) “quality of life” in Saint Paul. I’ve seen many, shall I say, “out of the ordinary” sites on my rides but this is the first time there has been a group of such distinctively dressed characters. I chanced upon such a situation riding north on the 2000 block of Wilder Avenue past Merriam Park (the park, not the neighborhood.) There was an assemblage of people dressed in a multiplicity of clothing, much of it more conducive to the Victorian era than 2014. An ‘ah ha’ moment at the corner of Wilder Avenue and Merriam Lane. The sign on the sidewalk answered the immediate question of what’s going on here, but that’s only the opening scene of the story. 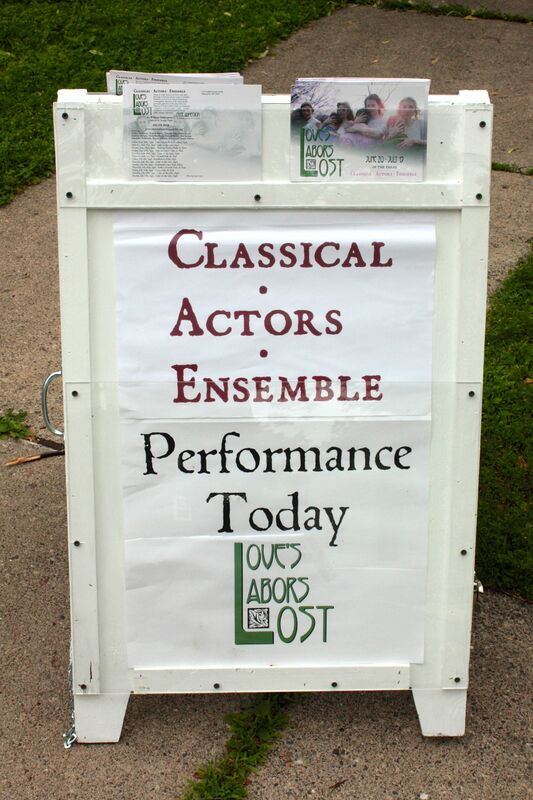 In 2009 Classical Actors Ensemble was established to perform works from the English Renaissance period, including Shakespeare and other playwrights. 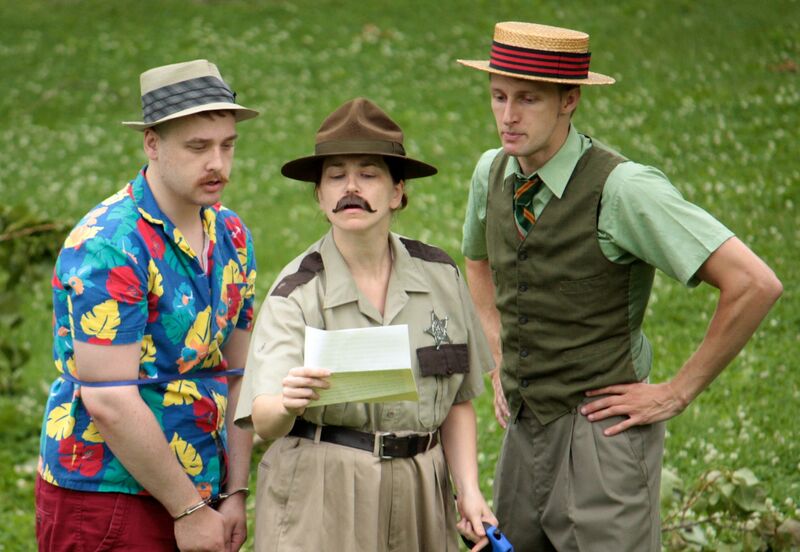 Today’s play, “Love’s Labors Lost “, one of Shakespeare’s comedies, is centered around a king and three of his friends who take an oath to stay away from women. 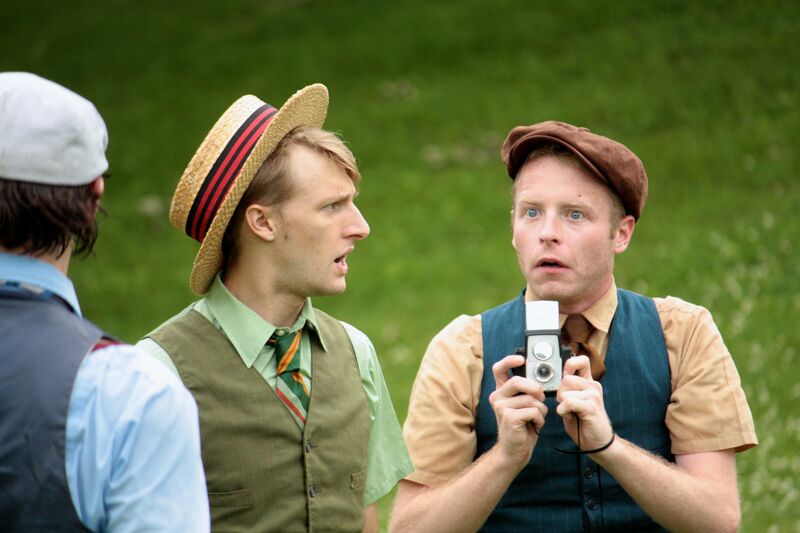 The play has a cast of 11 actors, a smaller group than the 20 or so performers in most of the Classical Actors Ensemble’s productions, according to Artistic Director Joseph Papke, whose tenor voice and precise diction revealed his training as an actor. 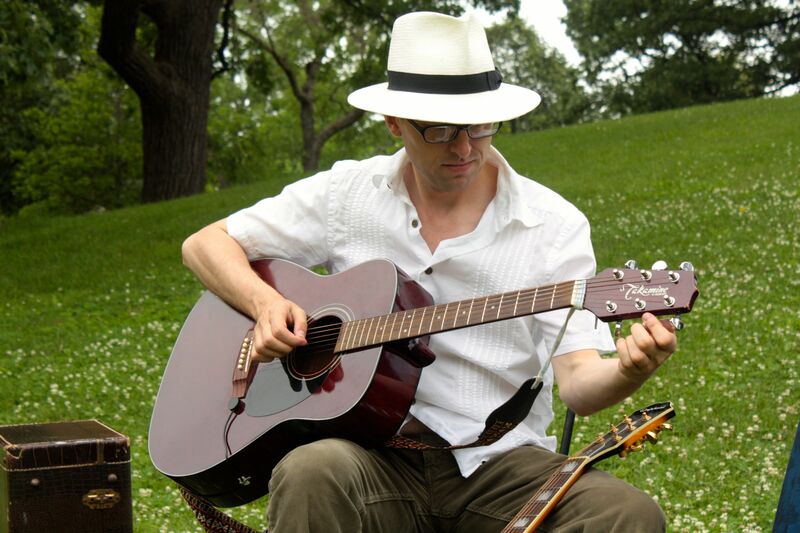 Artistic Director Joseph Papke tunes his guitar as show time grows near. 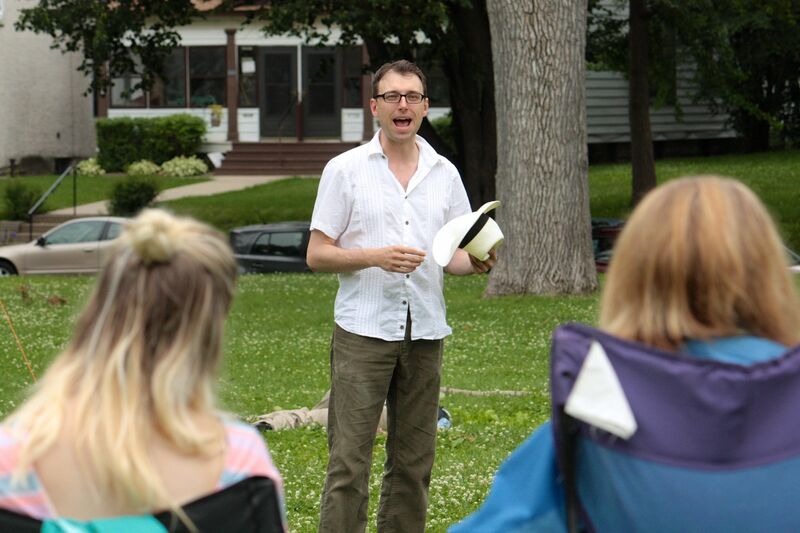 Joseph Papke provided the audience with some background about “Love’s Labor Lost”. 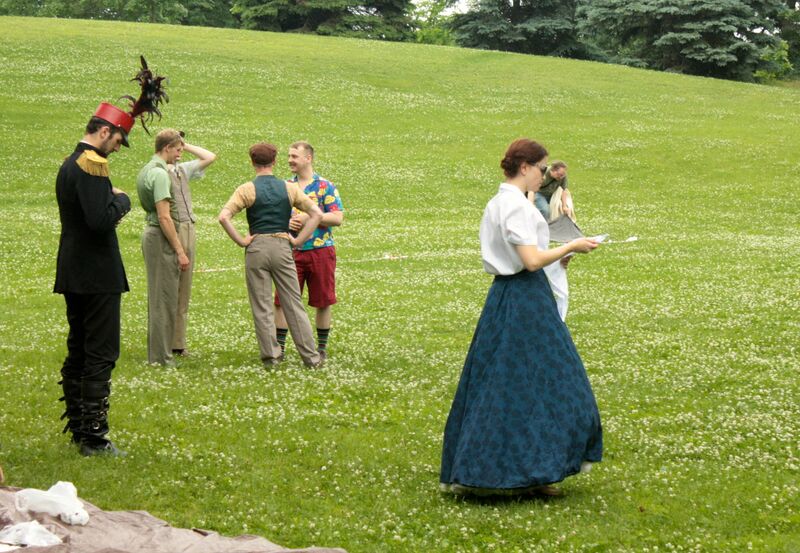 The actress in period clothing looking at her smartphone is an odd dichotomy. Several of the male actors discuss their women problems. The entrance to the recently closed Festival House, a low cost alternative to hotels for families of HealthEast patients. The building at 1709 Shields Street known today as Festival House was built in the mid-1940s as a dormitory for the Mounds-Midway Hospital nursing program. 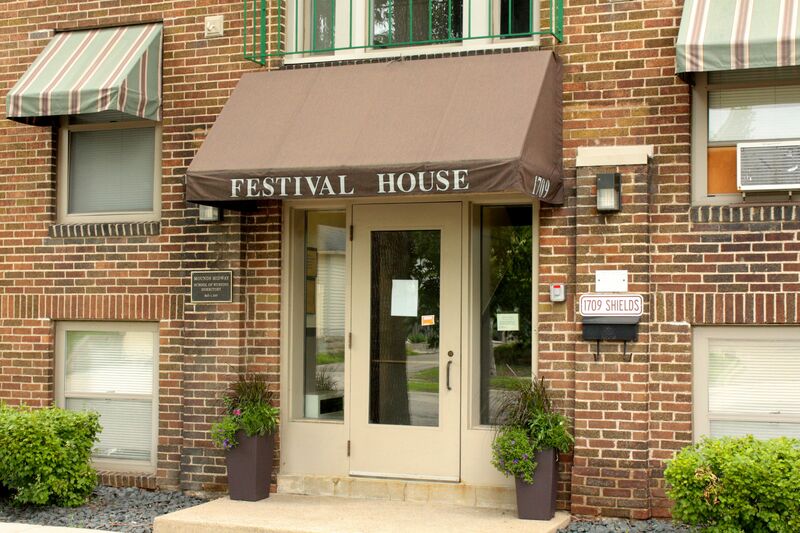 In 1998 the dorm was converted to Festival House, a temporary residence for families of HealthEast patients. Festival House was shuttered in August of this year. 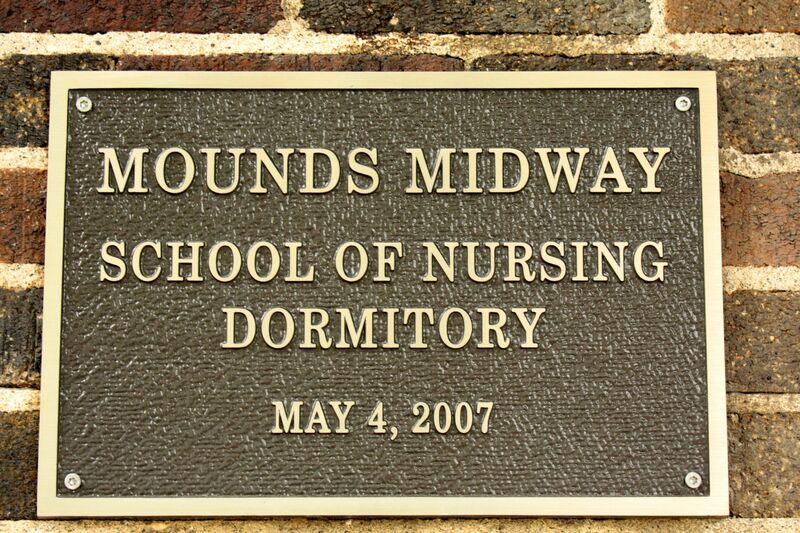 The plaque recognizing the history of the former Festival House as a dorm for nursing students. The Festival House building borders Aldine Avenue, across the street from HealthEast Midway Clinic, formerly Midway Hospital. 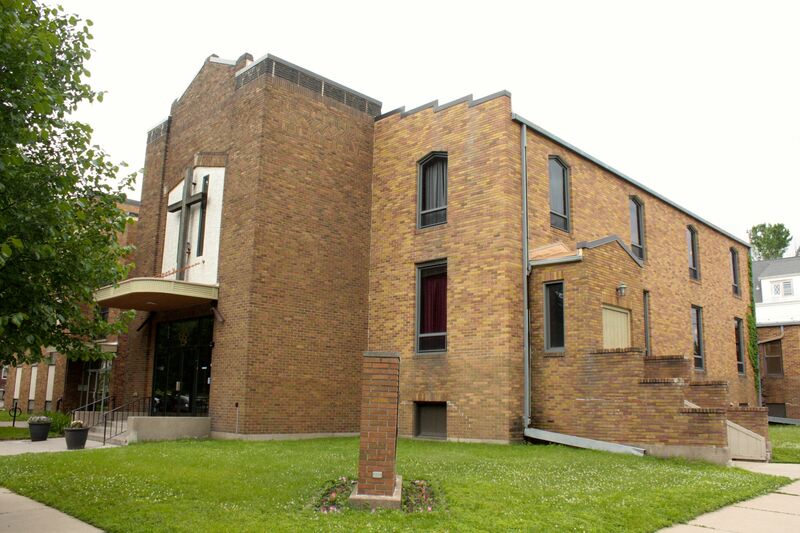 The church on Charles Avenue just east of Snelling characterizes this mixed neighborhood. The sign in front of 1632 Charles Avenue identifies the building as The Central Mission Church. Central Mission Church is one of at least three congregations using this building. 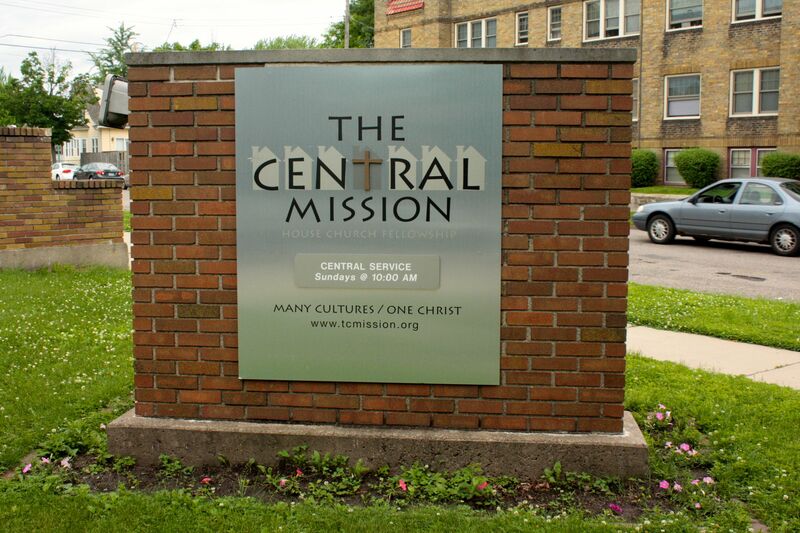 The Central Mission website indicates that it shares its facilities with Zion Evangelical Fellowship Church, a predominantly Ethiopian house of worship. A Google search of 1632 Charles turned up City Life Church, affiliated with the Presbyterian Church, as the third Christian denominational church located there. One previous iteration was the Midway Community Church at the same address. The City of Saint Paul turned Charles Avenue into a ‘bike boulevard’ this year. This is one of the signs of that, both figuratively and literally. This formal designation giving bikers greater rights on Charles Avenue, has been quite controversial, as changes like this usually are. Among the most vocal opponents were Snelling Avenue business owners and their supporters, who complained a new Snelling median at Charles would limit access and cut into their businesses. Tiled planters like this one line both sides of Snelling Avenue for several blocks north of University. The red Chevy in the background traveling south on Snelling had just left the Back to the ‘50s Weekend at the State Fair grounds. A close look at the colorful tile pattern on one of the planters. Today is the first full day of summer but 1363 Thomas displays a fully ornamented Christmas wreath. To the right the gutter has sprouted. The colorful mural, a tribute to the Hamline-Midway neighborhood, decorates the west wall of Groundswell Coffee at Thomas and Hamline. The Hamline Park Plaza office building. 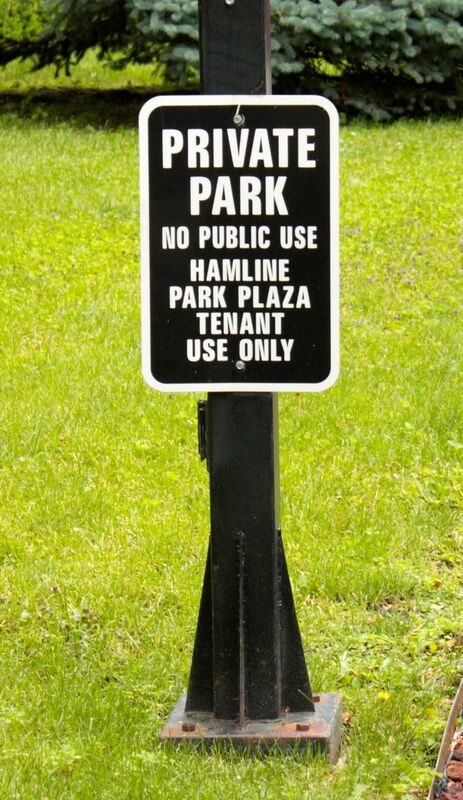 Hamline Park Plaza seems to appear out of nowhere. Bordered by Thomas Avenue, Simpson Street, Edmund Avenue and Asbury Street, it’s as if it were dropped into the center of a residential area. In reality, there have been buildings here, and on the block south (where Hamline Park Apartments and Townhomes are now located) since at least 1919 when the Northern Pacific Hospital opened. St. Paul’s Northern Pacific Hospital was one of seven the Northern Pacific Beneficial Association had built around the country to treat railroad workers. Northern Pacific Hospital in 1925. The street had yet to be paved when the picture was taken. Courtesy Minnesota Historical Society. According to a 2014 article in the Midway Como Monitor newspaper, Northern Pacific Hospital stood at 1515 Charles for more than 50 years. Its name was changed to Samaritan Hospital around 1971, the name it kept until its closing in 1987. The Physicians Plaza medical office building and adjacent parking garage opened at 570 Asbury Street in 1984 to serve Samaritan Hospital. Had hospital administrators known better, it’s doubtful either structure would have been built with building’s closing and demolition less than three years away. 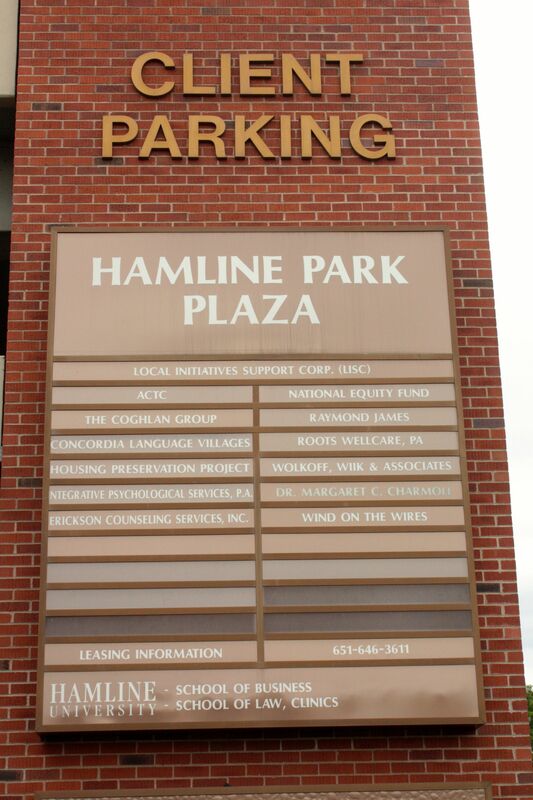 With Samaritan Hospital gone, Physicians Plaza was converted to general office space and rechristened Hamline Park Plaza. 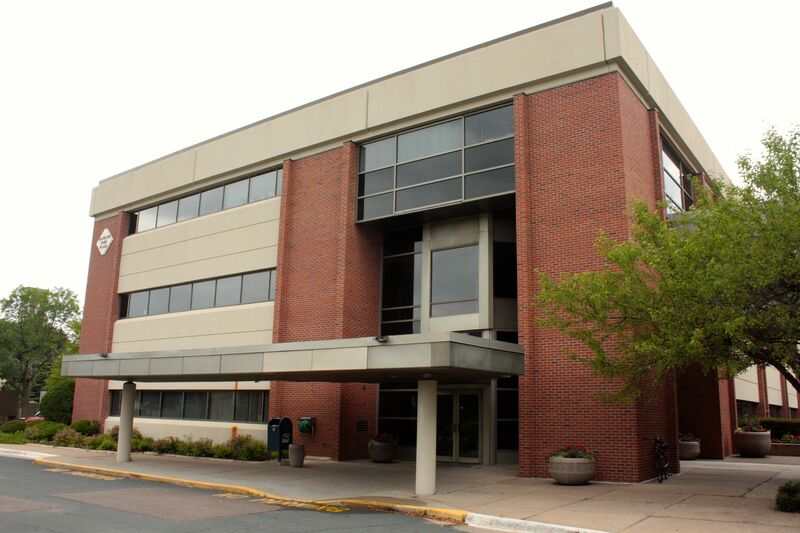 Hamline University’s School of Business administrative offices moved in about 1990. In addition to about 115 parking space for tenants and clients in the parking ramp, there are another 200-plus spaces for vehicle storage. An uncommon amenity of the complex is a private park. 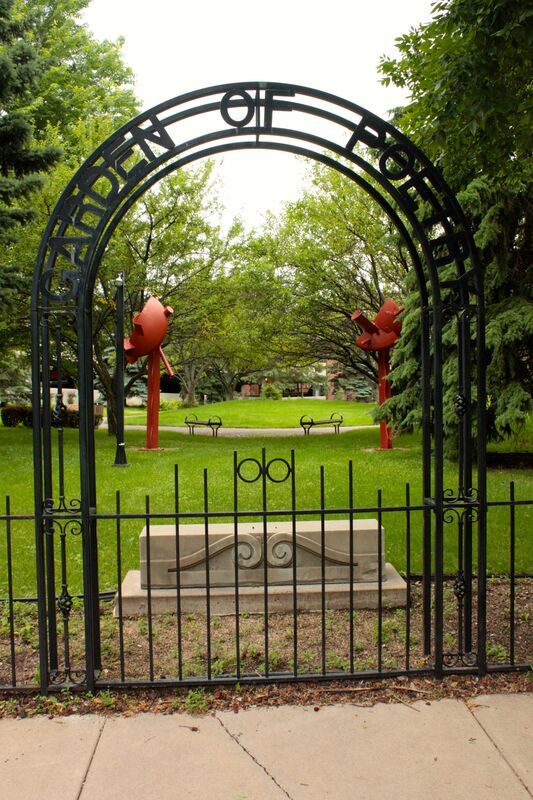 The private park, originally featured a sculpture garden known as the Garden of Poetry. Now it is a well manicured spot with enough benches, walking paths and trees and flowers to allow people to forget they’re a block off Snelling Avenue. Meanwhile, affordable apartments and townhomes were put up on the former site of Samaritan Hospital in 1990, according to Ramsey County records. 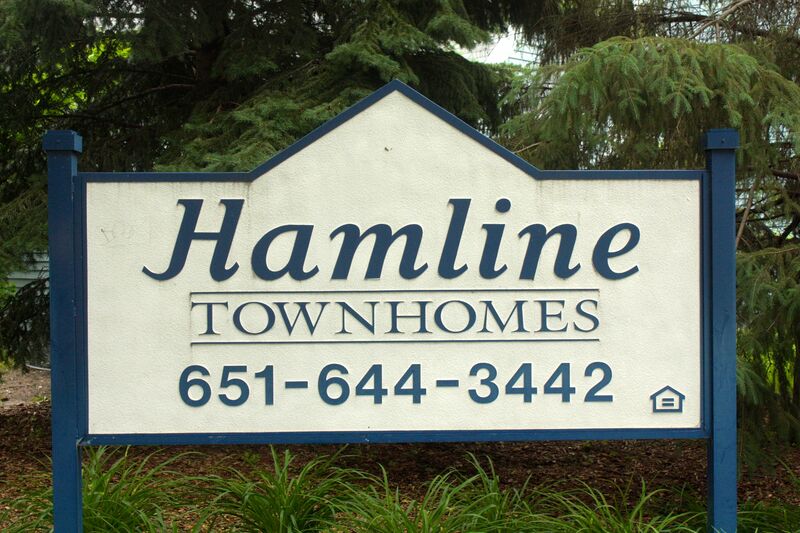 One section of the Hamline Townhomes which were constructed on the former site of Samaritan Hospital. 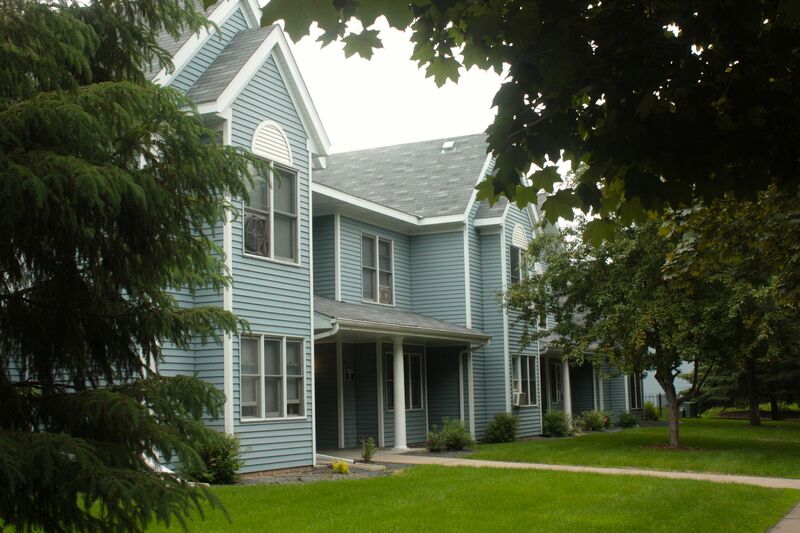 The Hamline Park development at Charles and Asbury is a mix of townhomes and apartments. 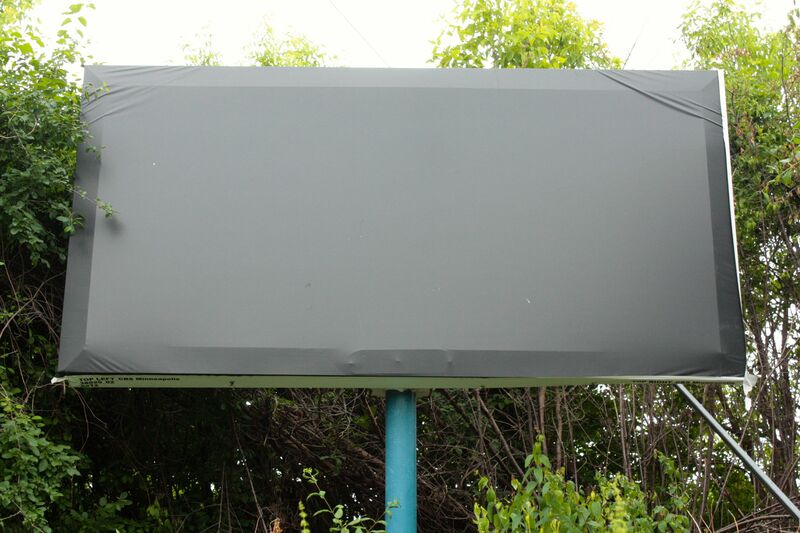 A billboard at St. Anthony Avenue and Prior Avenue awaits its official unveiling. 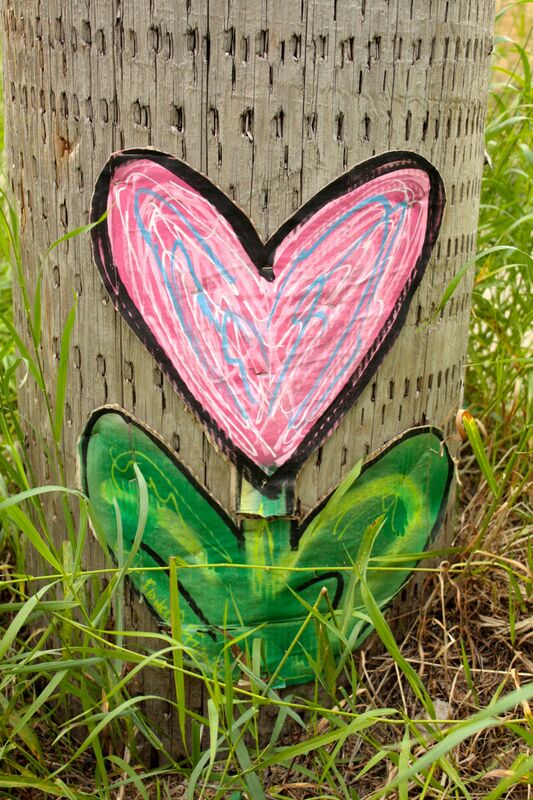 A beautification effort on a utility pole on Prior Avenue. Gilbert Avenue is the north frontage road of I-94 between Prior and Cleveland in Merriam Park. 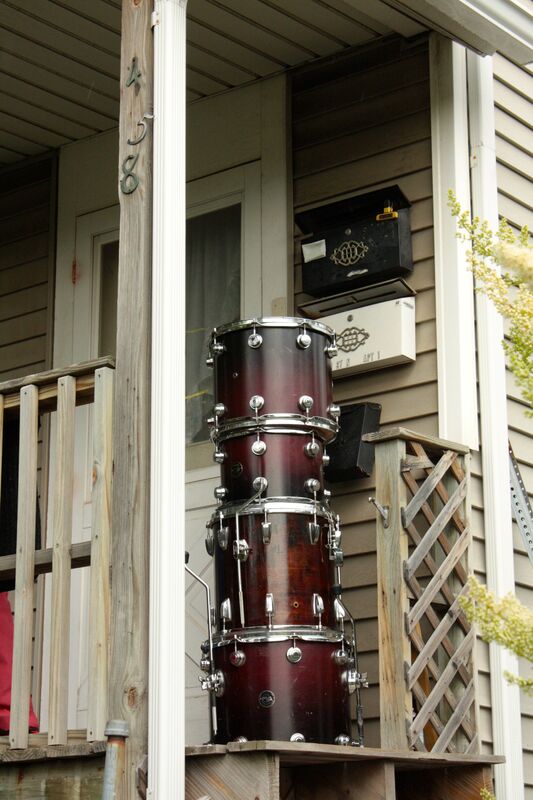 There is a community garden, a car repair facility and one house along Gilbert where these drums sat, neatly stacked on the on the front porch. Here is a link to today’s ride. I wouldn’t say that the Charles Avenue bikeway was controversial. As is usually the case with similar projects, there were a couple of very loud opponents who drew a disproportionate amount of attention. The main opponent was one of the owners of the funeral home on the corner of Charles and Snelling. I met him at a public workshop at which he declared that his funeral home would not only have it’s business cut into by a Snelling Avenue median, but that his business would be forced to close or be relocated “to the suburbs”. I asked him how he knew this would happen. I asked if he studied the impact on businesses of similar medians that have been added on Snelling and elsewhere in Saint Paul. He hadn’t. I asked him if he’s researched the impact of bikeways with some traffic diversion in other cities across the globe. He hadn’t. He said he “just knows” that his business would be rendered obsolete at this location. The funeral home is still open to this day, thankfully. The funeral home owner was able to scare the owner of Ellis Drum Shop and the owner of the Holiday Station, both nearby, into being opponents of the project. Both businesses are alive and well to this day. I see no shortage of cars filling up each time I pass by Holiday. However, they still refuse to stock vegetarian frozen pizzas so they somehow still endure without my business. Matty, I’d venture to say Charles was controversial in more than one way. The entire concept of the “bike boulevard” has it’s critics among bike advocates, and while I love the boulevard, I have issues with signalization at major cross streets. My daughter was hit at Charles and Dale last summer on a bike. Someone should go have a chat with those business owners next summer and see what they have to say then. Of course, you don’t need gas for a bicycle, and I heard that hearses are the go-to transpo mode for funeral homes. So maybe they’re still against it. It was certainly the least controversial significant bike project in Saint Paul, at least since I’ve been paying attention. Thanks for sharing another fascinating look at the streets of Saint Paul. I was pleasantly surprised by the grassy, green first photo on this chilly December morning, and now I’m dreaming about summer rides and park adventures to come. Enjoy the view at the Garden of Sculpture, it may be short lived. The owners have divided the lot, and the undeveloped area is for sale with multi-family housing the anticipated future use. The garden was open for public access until about 10 years ago, when it was sealed (the arch in your photo was the public entrance). Much of the art has been removed, and it is now only accessible from inside the office building. Long story, ancient history, and not worth repeating.